Samsung Galaxy S6 Edge+, Galaxy Note 5: Physical keyboards are back. Samsung’s new keyboard cover will be compatible with the Galaxy S6 Edge+ and Galaxy Note5, released Thursday. There was a time when the launch of a new smartphone meant fascinating changes to the way we interacted with our devices. Or perhaps it’s simply nostalgic to think so. In any case, that halcyon time, if it ever existed, is no more. These days a new smartphone from the likes of Apple or Samsung means marginal performance improvements, the addition and removal of various bells and whistles, and seemingly arbitrary changes in color, materials, and form. That isn’t an indictment of the category. Smartphones have simply gotten good enough at what they do that they don’t cry out for annual reinvention. Nevertheless, convention dictates that their purveyors continue to roll out new releases that can lay at least some claim to being different from those that came before. Such is the case with Samsung’s next flagship phablets, announced Thursday to unjustified fanfare in a grand venue at Lincoln Center in New York City. The Galaxy S5 Edge+ and the Galaxy Note6—err, sorry, the Galaxy S6 Edge+ and the Galaxy Note5—offer just enough fresh features and incremental upgrades to excite the tech press, without doing much of anything that you haven’t already come to expect a fancy smartphone to do. The Note5 gets an improved stylus, for those who like that sort of thing. The S6 Edge+ is a somewhat larger version of the curvy, glassy S6 Edge, which was released earlier this year. There is one accessory, however, that could set Samsung’s latest apart from the field, at least in theory: a physical keyboard. For those still lamenting the touchscreen revolution that the original iPhone begot, each of the new Samsung phones will be compatible with a new hardware keyboard accessory that snaps over the bottom half of the phone. BlackBerry lovers, rejoice! Ryan Seacrest is vindicated! Steve Jobs was wrong all along! OK, maybe a feature cribbed from the cutting edge of 1999’s mobile technology isn’t likely to take the industry by storm. Touchscreen phones took a while to get used to, but eight years was probably enough for most of us. Still, Samsung’s current see-what-sticks approach to smartphone design is more interesting than simply aping Apple, as it used to do. Just because Apple finds success with one aesthetic doesn’t mean it’s right for everyone. It was Samsung that popularized the larger screens that now dominate the market, forcing Apple to reverse course on its yearslong “smaller is better” crusade. And in the tablet realm, Microsoft’s Surface has carved out an audience with the help of its elegantly conceived Type Cover keyboard. 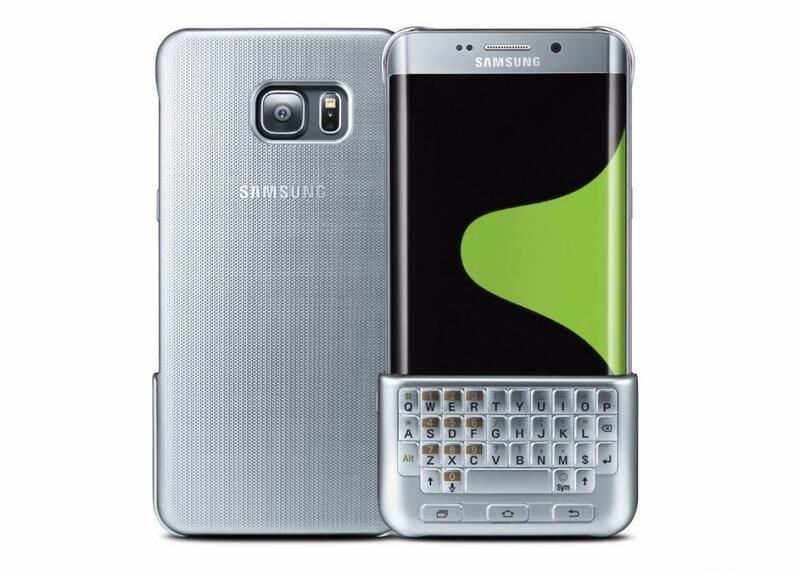 Probably the keyboard will appeal only to a small segment of Samsung’s enormous global customer base. But even if it flops as an accessory, it will have succeeded at one thing: ginning up just a little more attention for yet another otherwise desultory smartphone launch. These days, that’s about all we can ask.